Born in 1933 in Swissvale, Pennsylvania, Shirley "Hustle" Burkovich (right) toured with the 1950 Springfield Sallies and Chicago Colleens before playing for the Rockford Peaches in 1951. She played a total of 37 games, and is credited with ending a twelve-inning game by hitting a single into center field to drive in the winning run. Shirley appeared with a speaking part in A League of Their Own, playing the fictional character of Alice "Skeeter" Jaspers at a later age. Actress Renee Coleman played the younger Alice Jaspers. Player's Association. 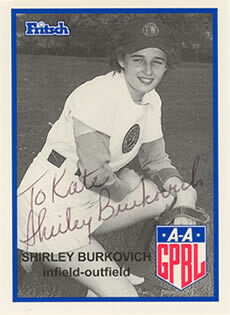 The association puts out a yearly newsletter, and works to preserve the memories of the AAGPBL. They also assist in seminars to promote women in sports. To receive the newsletter or to become a member of the players association, click here. The information above was contributed by Shirley's cousin's granddaughter, Kate Flister. Thanks Kate.